Together with growing demand in PaaS and DevOps solutions, we can notice a set of adoption barriers for the owners of legacy applications hosted inside VMs or just on top of bare metal servers. The complexity of decomposition and migration processes is often very high. Usually, application owners have to redesign their application architecture in order to benefit from the modern PaaS and CaaS solutions. In this article, we will analyze the specific challenges of migrating Java legacy applications that are running inside VMs to container based platforms. And using the example of Oracle WebLogic Server, we’ll show the exact steps of decomposition process and the outcome of this migration. Hardware virtualization was a great step forward in the hosting of Java EE applications compared to the era of Bare Metal. It gave us the ability to isolate multiple applications from each other and utilize hardware more efficiently. However, with Hypervisors, each VM requires its own full OS, TCP and file system stacks, which uses significant processing power and memory of the host machine. 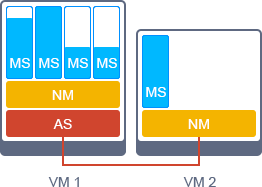 Each VM has a fixed amount of RAM and only some hypervisors can resize VMs while running with a help of memory ballooning that is not a trivial task. As a result, usually we reserve resources in each VM for the further scaling of the application. These resources are not fully utilized and, at the same time, they cannot be shared with other applications due to the lack of proper instances isolation inside a VM. Containers take performance and resource utilization a step further by sharing the OS kernel, TCP stack, file system and other system resources of the host machine while using less memory and CPU overhead. There are two types of containers – application container and system container. Usually, an application container runs as little as a single process. And a system container behaves like a full OS and can run full-featured init systems like systemd, SysVinit, openrc that allow to spawn other processes like openssh, crond, syslogd together inside a single container. Both types of containers are useful in different cases and do not waste RAM on redundant management processes, generally consuming less RAM than VM. However, only with system containers migration of legacy Java EE applications is possible without massive application redesign. Unlike VMs the resource limits in containers can be easily changed on the running instances without restart. And the resources that are not consumed within the limit boundaries are automatically shared with other containers running on the same hardware node. The resources that are not utilized at the hardware can be easily used by the existing containers while scaling or for new applications workloads. Considering advanced containers isolation, different types of applications can be run on the same hardware node not influencing each other. This allows increasing resource utilization of the existing infrastructure on 3x-10x times in average. In addition, containers are very useful for developers who want to create, package and test applications in an agile way to accelerate application development processes and improve the scalability of applications. Decomposition is an essential part of the migration process. It helps to split large monolithic application topology into small logical pieces and work with them independently later. A simple representation of the decomposition process for migration from VM to containers is shown in the picture below. There’s an old saying in software application development: “Legacy software is fine. It’s just old software that still works.” So let’s see more precisely how it works based on the example of Oracle WebLogic Server. Administration Server is the central point from which we configure and manage all resources in the cluster. It is connected to Node Managers that are responsible for adding and removing Managed Server instances. Managed Servers host web applications, EJBs, web services and other resources. Usually, each VM hosts one Node Manager and several Managed Servers inside. As well as one Administration Server is used for managing all instances across many VMs. More detailed description of each component can be found in the official documentation. Now let’s imagine we got a traffic spike and require to scale the cluster. 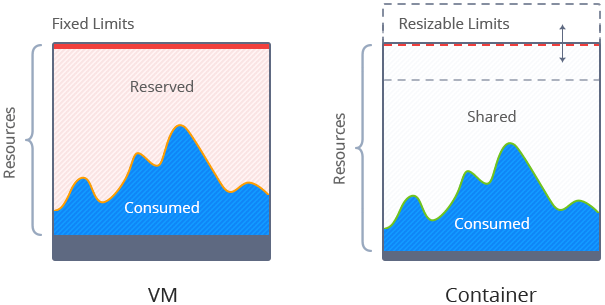 To handle the increased load new Managed Servers will be added to VM till reaching resource limits (e.g. RAM). But the incoming traffic is growing and a current number of Managed Server instances is not enough to handle the load, so we need to add a new VM to be able to further scale the application. Provision a new VM with preconfigured WebLogic Server template. Start Node Manager inside the newly added VM and connect it to the Administration Server. Add new Managed Servers to handle a part of the increased load. Afterward, the scaling process repeats, we launch more Managed Servers inside the recently added VM until it reaches the resource limits. These days we can find several good application servers and frameworks that are designed to be run as microservices in containers, such as Spring Boot, WildFly Swarm, Payara Micro and others. However, there is a set of servers specifically designed for running in VM, like Oracle WebLogic Server, and the task of migration to containers for such instances is more complex. That is why we’d like to pay more attention to this case in our article. First of all, we need to prepare a container image with WebLogic Server. It’s quite an easy task these days with help of Docker containers (e.g. check the official Oracle repo). When Docker template is ready we provision each instance inside an isolated container: one Administration Server and the needed number of Managed Servers. At this point, we can get rid of Node Manager role, as it was designed as a VM agent to add and remove Managed Server instances. After migration to containers, Managed Server instances can be added / removed automatically as well as can be directly attached to Administration Server using container orchestration platform and a set of WSLT scripts. As a result, we get much simpler topology of our Weblogic Server Cluster. Now the horizontal scaling process became very granular and smooth, as a container can be easily provisioned from the scratch or cloned. Moreover, each container can be scaled up and down on the fly with no downtime. It is much thinner compared to virtual machines, so this operation takes much less time compared to scaling with VMs. A similar approach can help to decompose other layers of the application or can be applied to other Java EE application servers. And in the next articles, we’ll describe how to deal with the data after decomposition and show the whole process on a specific example. Need more details or assistance? Get in touch, share your use case and experience in Java legacy application decomposition and migration to containers.